In honor of 50 years in business, Peet's Coffee & Tea is establishing itself as the original craft coffee brewer with a widespread digital- and social media-driven campaign. While the brand hasn't done much advertising in the past, the team felt the 50-year benchmark was the perfect time to tell coffee lovers about its high quality products and the man behind the brand, Alfred Peet. Peet opened the first location in 1966 on the corner of Walnut Street and Vine Street in Berkeley, Calif. The Holland-born entrepreneur brought with him a unique brewing style, creating small batches using hand-roasted beans and helped kick off a food and coffee revolution in the Bay Area. The campaign aims to reflect the passion Peet had for his coffee and the continued dedication the brand has for its product. "We go to great lengths to ensure the quality of our coffee and abide by the same standards that Alfred Peet established when he started Peet's 50 years ago from sourcing the world's best beans, to hand roasting, to hand crafting and ensuring the freshness overall," Andrea Fernandes, director of brand marketing for Peet's Coffee & Tea, said. 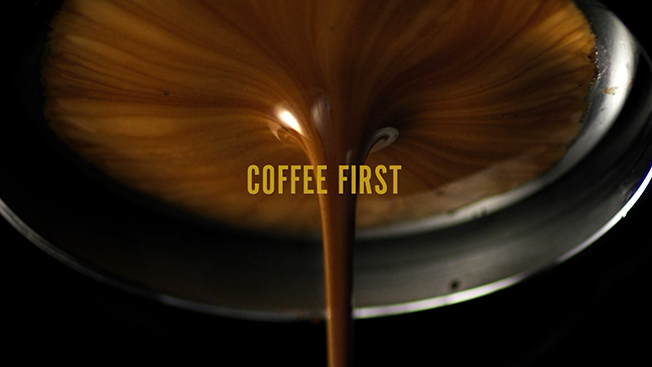 Cutwater, Peet's agency of record, used the idea of "coffee first, everything else second" as the driving force for the campaign. "Not only does 'coffee first, everything else second' evoke the feeling you get when you get your first cup of coffee in the morning, but it seemed like the right verbal expression that really reflects the brand's true commitment to coffee," Christian Navarro, group account director at Cutwater, told Adweek. Cutwater created a number of videos for the campaign with shots of cream flowing into a cup of coffee, espresso being poured and coffee beans being ground. There are also a group of captivating cinemagraphs, which will be used across social media. Outdoor advertising is another component of the campaign, but it will be focused to key markets including San Francisco, as most Peet's locations are in California. However, the brand does deliver beans throughout the country and roasts them within 24 hours of the order, so strong digital visuals play a big part in the work. "A lot of visuals you will see are these really rich, beautiful images of coffee," Fernandes said. "We hand pour all of our shots. We hand make all of our beverages unlike our main competitors. They're using buttons to make their drinks." On the brand's actual 50th anniversary, which just so happens to fall on April Fools' Day, Cutwater came up with the idea to tell coffee connoisseurs about the brand's truths, rather than pulling some outlandish prank. Leading up to the day, Peet's plans to roll out a 30-second spot featuring a barista and Peet's roaster getting grilled about the quality of the product while hooked up to a polygraph machine. The campaign will extend across social media with the hashtag #NoFooling. If you're lucky enough to live near a Peet's location you can also purchase a cup of coffee for 50 cents on April 1. Seriously, it's not a joke!